Newcastle disease is a highly contagious viral disease negatively affecting poultry in the West African region where 40-70% of unvaccinated rural poultry are killed by the disease. The risk and impact of the virus, which spreads easily throughout flocks, can vary in severity from strain to strain and is also dependent on environmental conditions (such as immunity and the animal’s overall health). Outbreaks can occur at any time of the year, but happen with greater frequency during the cold season. Vaccination is the only prevention method for this disease and there is currently an effective, affordable vaccine (50 CFAF / subject) that is heat-stable and easy use for the smallholder farmers (administered by eye drop) that is produced in Niger. The vaccine is called I-2 vaccine (produced with strain I-2 virus) and is critical in the effort to promote animal health in Niger and the Sahelian region. To significantly reduce the mortality rate of poultry in Niger, the NGO « Poulailler du Développement » provided the I-2 vaccine and sought the support of REGIS -AG project to organize a broad awareness campaign, in order to inform poultry farmers on the control of Newcastle disease, encourage producers to allow auxiliary veterinarian networks (SVPP) administer the I-2 vaccine. This operation was conducted in November 2015 in the Tillaberi region with support from REGIS–AG and REGIS -ER and continues to stimulate much enthusiasm in rural areas. 723,704 subjects were vaccinated in the Tillaberi campaign, including chickens, guinea fowl, pigeons, and ducks. The Tillaberri vaccination campaign against the Newcastle disease was extremely successful and partners both in the public and private sector are working to replicate similar activities in Maradi and Zinder. REGIS-AG and partners REGIS-ER and VSF will work together to facilitate and scale up this beneficial activity to its other operational areas. It is also called “Newcastle disease “,” avian pneumoencephalitis “or “Ranikhet disease.” It is also known under the generic name of “fowl plague”. The Centro de Formacao Agro-Pecuaria de Siloe is an agricultural training center located in Ihamizua, about 10 miles from Beira, Mozambique. The center has a strong focus on social and environmental responsibility and trains youth in vegetable production, entrepreneurship, and small livestock and poultry production. Each year, 25 youth graduate from the center’s training on environmentally minded horticulture practices, including organic cultivation methods, integrated pest management and basic composting. In addition to youth education, the center produces food for a local orphanage for about 100 children, and sells the surplus vegetables and chickens for revenue to help sustain the organization. Despite its success, Centro de Formacao Agro-Pecuaria de Siloe continued to look for ways to increase its social and environmental impact in the community. USAID’s Farmer-to-Farmer (F2F) Program, implemented by CNFA in Southern Africa, visited the center to explore ways the F2F program could strengthen one of the center’s key natural resources – the soil. CNFA fielded Ms. Matilde D’Urzo, a soil fertility expert who had previously volunteered with CNFA in Mozambique, to train the center on cost-effective and sustainable strategies to improve soil quality. Ms. D’Urzo provided the center with trainings on how to prepare compost and organic fertilizers, how to apply mulch to vegetable beds and how to increase production through the intensification and diversification of crops (soil management). Esnath Tshuma, 45, lives in Tjompani village with her 13 year-old nephew, Tandana. Esnath is a strong-willed woman who has worked hard throughout the years, but her life irrevocably changed after sustaining a severe injury three years ago. In November of 2012, Esnath was repairing a fence in her field, when she turned and lodged her foot in the fence. She fell, twisting her leg and fracturing a bone in the process. The injury resulted in paralysis of her leg and impaired mobility of her right hand. She is now limited to walking with crutches, as well as a using a plastic yard chair in lieu of a proper wheelchair to maneuver around her compound. Her husband travelled to South Africa to look for work in August 2015, but has not been able to find a steady source of income. She receives a bit of money from her brother who works in Bulawayo, but since her injury, she has been relying on the kindness of her neighbors and the sale of her own personal items, like used blankets and dresses, to make ends meet. “After my injury in 2012, I felt like I couldn’t do anything and was spending a lot of time sitting around idle,” said Esnath. She explained that due to her disability, she was no longer able to perform most of her daily activities like fetching water, collecting firewood, and farming. Cooking over an open fire on the ground was a particularly uncomfortable task, but she was unwilling to give up this role. Esnath demonstrates her improved cooking method. Less smoke is emitted from the eco-stove, which also allows her to cook indoors. Esnath was thrilled when in early 2014, her sister-in-law, Tshihomanana Tshuma, offered to build her a clay stove that would allow her to sit while cooking. Tshihomanana participated in an Amalima training to learn how to build an environmentally friendly, fuel-efficient ‘eco-stove.’ After learning how to work with the clay, she realized that she could easily build a platform for Esnath’s eco-stove to allow for cooking while seated. The results were perfect; not only is Esnath able to complete her daily chores with increased comfort, but due to the eco-stove’s fuel-efficiency, her young nephew saves time and energy searching for increasingly scarce firewood in the bush. 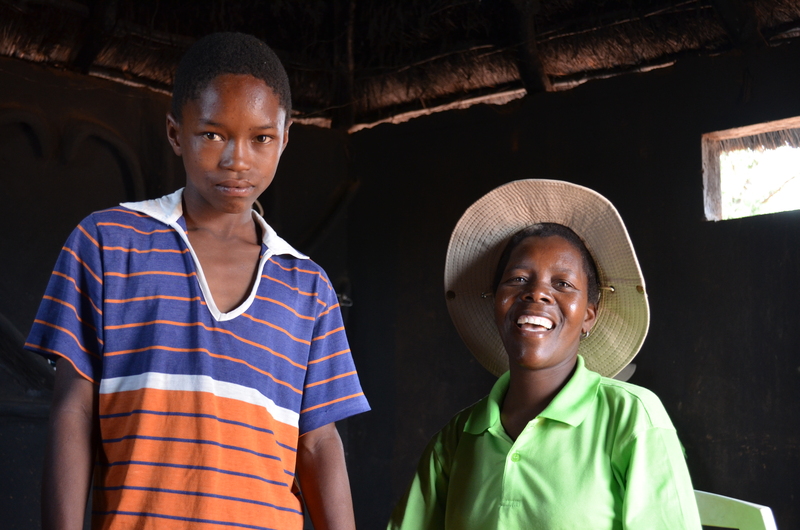 Tshihomanana learned about Amalima’s Community Health Clubs (CHC) through the eco-stove training, and asked Esnath to join her in participating. CHCs promote increased awareness of water, sanitation and hygiene (WASH) practices in communities through completion of a 20 module Participatory Health and Hygiene Education (PHHE) training. CHCs foster learning for change through promotion of practical improvements at the household level to change the behaviors of community members in favor of a more hygienic environment. In March 2014, 16 women and one man from Tjompani village established the Mukani CHC and began receiving lessons from Nosizo Dube, their neighbor and Community Based Facilitator (CBF). “After joining the CHC, I realized that I could stand up for myself and do something with my life,” noted Esnath. The lessons highlighted vital steps to improving hygiene that Esnath was capable of completing at home, such as sweeping, washing hands at critical times, using a 2-cup water system, rubbish disposal and cleaning dishes. Perhaps more importantly, belonging to the club gave her a special comradery with her group members. The members proved to be more than just a social outlet; recognizing her needs, the group pitched in to build Esnath a tippy-tap hand washing station, a private bathing area, and a rubbish pit at her homestead. Left: Esnath and Tshihomanana with her private bathing area. Right: Mukani members wash hands at Esnath’s tippy-tap. After completing the PHHE sessions, all 17 Mukani CHC members graduated at a community-wide ceremony. After this milestone, the members recognized a positive momentum with their initiative and made the decision to continue working together as a Village Savings and Lending (VS&L) group. To make this transition, they received training on VS&L methodology from Amalima, including group formation, constitution development, group fund development, loans and loan appraisal, and record keeping. Mukani group held its first VS&L meeting in August 2015. Their objective is to save for short-term needs such as food, kitchen utensils and school fees, as well as to pool financial resources for larger, higher-impact income generating activities. 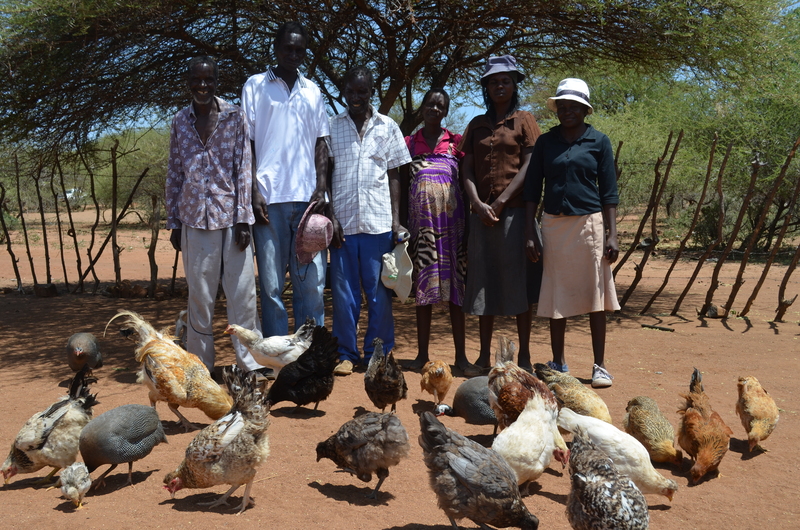 The group’s long-term goal is to establish a poultry business with their savings. At each meeting, hosted by a different member on rotation, members make a $10 contribution. Each month $10 is set aside for group savings and investment in their poultry business, which they hope to establish later this year. The remaining cash is used to provide the hosting member with kitchen utensils and a goat valued at approximately $35. The balance is then shared out evenly among members for their household use. The group has $70 saved to date. Tandana and Esnath together at home. Esnath already has plans to grow her small livestock herd with the goat she received from hosting the December 2015 meeting. She is also looking forward to being involved in the poultry income generating activity to become economically self-sufficient; the group considered her accessibility when selecting where the chicken coop will be located. After receiving her eco-stove and joining the Mukani club, Esnath recognized her ability to lead a full life. The training Esnath received from Amalima is invaluable, yet the support and friendship from her group members has been as vital to her livelihood. She is grateful for the opportunity to join the CHC. “It has given me a sense of purpose,” she says. As the arid climate of the Matebeleland region in Zimbabwe is not particularly suitable for crop production, a majority of rural Zimbabweans in this area rely on livestock production for their livelihoods. These farmers face many challenges, namely access to water and resources to protect and maintain livestock health. Traditionally, small holder farmers in Zimbabwe have depended on skilled veterinary services and NGO personnel for livestock health services such as dehorning, castration, vaccination, dosing and other treatments. Yet, veterinary extension officers are burdened with a zone of coverage that is too expansive to meet the needs of most farmers and animals in their regions. To purchase vaccines or visit the nearest Department of Veterinary Services Doctor, small holder farmers must often travel long distances and pay debilitating amounts of money. To address the gap in services, the Amalima program is training Lead Farmers and Paravets (auxiliary animal health workers) to provide much needed veterinary services to local communities and to increase knowledge about effective livestock management practices in three major areas: disease prevention; supplementary feeding, and improved breeding. Sibanda says he draws his motivation for this work from the knowledge that livestock can empower farmers economically. Mr. Putshe Sibanda of Mzila Village is a farmer, husband, father of seven, and Village Savings and Loan (VS&L) group member, but he has now added one more commitment to his already busy schedule: community Paravet. As an owner of 13 cattle, 34 goats and many chickens, Sibanda sought to improve the health of his livestock by participating in Amalima Lead Farmer livestock training. Sibanda was determined to put what he learned into practice. Armed with his new understanding of improved livestock management practices, he reached out to farmers in his community to train others about animal health. 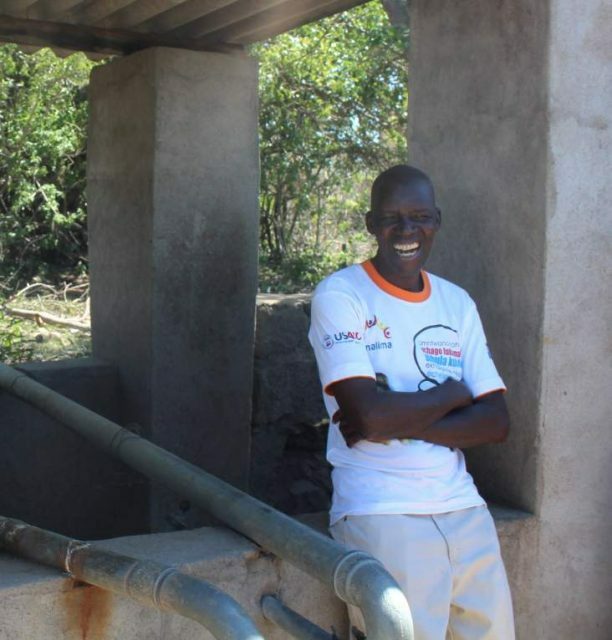 As an Amalima Lead Farmer, Sibanda committed to reaching 10 farmers through a cascading training model– but he easily reached 30 individuals in a matter of weeks. He saw that there was a demand for livestock management training in his community with participants young and old, male and female, wanting to improve their livelihoods by investing in their livestock. After the success of his initial trainings, Sibanda elected to participate in additional Amalima and Department of Veterinary Services (DVS) training in September 2014 to become a Paravet. These trainings cover both theory and hands-on application of various practices such as disease prevention, identification, and treatment, nutrition (supplementary feeding, pen fattening and feed harvesting), breed improvement, dehorning, and the calving process. Since participating in this training and assuming his new role as a Paravet, Sibanda has worked with over 100 households to treat more than 500 goats, 300 kids, 300 cattle and 1,000 chickens. He treats issues ranging from popped and pulpy kidneys and blocked udders to diarrhea and birthing complications. Sibanda says he draws his motivation for this work from the potential financial empowerment that livestock production can provide for small holder farmers. Sibanda, as with all Amalima-trained Paravets, does not charge a fee for his services. Even after the countless hours of work he has volunteered, he remains focused on a larger goal for his community: “I want my neighbors to also succeed with their livestock and not suffer,” he says. Sibanda believes in a two-pronged approach to improving animal health and livestock production: training community members on livestock management skills and increasing access to localized veterinary services and vaccines. He sees these inputs as key to increasing livestock herds and, in turn, improving the livelihoods and food security of whole communities. Members of surrounding communities now consult him on a regular basis. 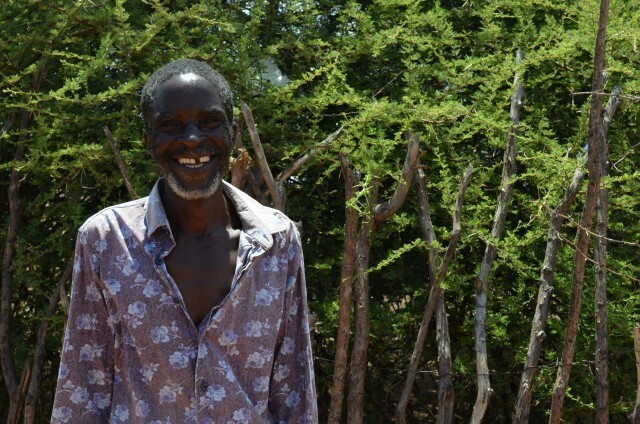 Through his training and home-visits, he helps other farmers establish good habits for livestock management. Often, when making a home-visit, he will invite one of his trainees to accompany him to gain valuable hands-on experience. Two of his trainees have started helping other farmers in their communities with livestock issues, further spreading improved animal husbandry practices in the process. In light of the poor rainfall this season, Sibanda also encouraged farmers to re-plant small-grains and beans in mid-late January. If the crops do not produce food for humans, the stalks and leaves can be used as fodder for animals in upcoming months. In addition, he trains farmers to dig a large storage hole, line it with plastic, and keep grasses and other forage in this cool, dry space to keep feed fresh. Sibanda (left) with trainees from Mashasha livestock group in Mzila village, who also participate in the communal livestock medication supply system. Sibanda’s role as community paravet exceeds that of a trainer and veterinary service provider; he is mobilizing entire communities to practice sustainable livestock management practices. In Mzila village, he has established a communal vaccination and medication supply system. Participating farmers purchase a vial of medication that is suitable to local animals, and Sibanda coordinates with the group to make sure that an appropriate variety is acquired. He also instructs each household on proper storage of the medicine in a cool, dry space. The purchased medication is then part of a communal supply available to all contributors if their animal(s) fall ill, with Sibanda responsible for applying the treatment. Inventory is calculated periodically to determine how and by whom supplies were used, and how they should be replenished. Through this investment, the community is controlling and preventing the spread of disease. As a Paravet and community mobilizer, Mr. Sibanda is leading the way with his sights planted firmly on a future where resilient communities are earning their livelihoods by practicing smart, livestock management. This story, written by Allison DiVincenzo and Katie Murray, first appeared in USAID’s bimonthly publication, FrontLines. The majority of farmers in the Matabeleland region of Zimbabwe rely on rains for their agricultural activities. When rains are poor or erratic, crops fail, harvests suffer and people don’t have enough food to eat. Tsholotsho district in Matabeleland North is no exception. This area is characterized by low, unpredictable rainfall during the farming season and year-round arid conditions. Farmers are often forced to rely on alternative coping strategies, including remittances, paid casual labor and craft-making, to make it through the lean season. However, cultivation methods based on low-till conservation agriculture (CA) promoted by the USAID-funded Amalima program are improving harvest yields in this dry environment and influencing many households in the process. Cecilia Ncube, 66 years old, is a smallholder farmer in Zenzeleni village of Tsholotsho. She is a widower and lives with her three daughters and five small grandchildren. Several of her children are in South Africa and send back remittances on a monthly basis, which, combined with income from basket-making, is how Cecelia survives. Concerned about her family’s precarious livelihood and food security situation, she decided to participate in the Amalima program’s CA training. “I am so excited that I am taking part in this conservation farming intervention. Before the Amalima program arrived, I would use draught power to till most of my land. I would have to wait for other villagers to finish ploughing their fields before they would let me borrow their oxen. 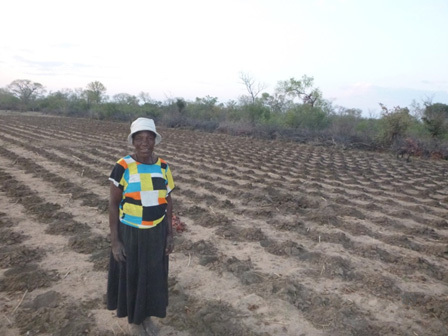 I realized that every time I was ploughing too late, well after the planting rains had gone, and more importantly, this method made the soils quickly dry off,” says Cecilia. Amalima builds on existing communal initiatives in order to improve household food security and nutrition status through initiatives like conservation agriculture and livestock trainings, improving access to agricultural inputs and strengthening community resilience to economic and climatic shocks. The Amalima program draws its name from the Ndebele word for the social contract by which families come together to help each other engage in productive activities such as land cultivation, livestock tending, and asset building. Conservation agriculture (CA) is a set of soil management practices that minimize the disruption of the soil’s structure, composition and natural biodiversity. CA has proven potential to increase crop yields, while improving the long-term sustainability of farming. As part of land preparation, farmers dig planting basins rather than plowing the whole field and lay manure fertilizer in the basins before planting. This method of field preparation minimizes soil disturbance, consequently reducing erosion and increasingmoisture retention when the rains fall. Specific spacing guidelines also promote maximum yields. Amalima CA training covers land preparation methods, fertilizer application, planting, pest management and post-harvest handling. “At first I thought this process was too labor intensive and I didn’t see how I would be able to till a reasonable piece of land. But our mentors, Amalima field staff and AGRITEX [GoZ Agricultural Extension] Officers encouraged us to work in groups of ten so that we could assist each other with land preparation. Working this way, we were then able to work on one plot a day,” she explained. Cecelia is now part of a conservation farming group made up of 10 women in her village who also participated in the Amalima training. Soils around Zenzeleni village are sandy and the group had to collect cow dung around the nearest watering borehole to place in their planting basins to enhance soil fertility and reduce the loss of soil nutrients from water run-off. According to Cecelia’s group’s constitution, members provide assistance preparing 0.5 hectare of each members’ field using CA techniques. As a result of this cooperation, Cecelia managed to complete the millet planting on her plot before the first rains in the 2014/2015 season and was excited to compare the results of her CA and conventional plots. In January 2015, Cecelia explained, “With good rains this year, I am expecting to harvest 300kgs of millet on this 50m by 50m (0.3 ha) piece of land. On the same piece of land I used to get around 150kgs of millet using conventional farming.” A few months later, the sorghum in her CA plot was a lush green in comparison to the crops in her conventional plot. Cecilia lamented that if she had known that the millet in the CA plot would do so much better than in the conventional farming plot, she would have dug CA planting basins throughout her fields herself. At left, Cecilia with her lush CA millet plot in January of 2015. Right, she stands with her conventional farming millet plot on the same day. The 2014/2015 season did not bring good rains – rainfall was 40 percent below normal in Tsholotsho – but Cecelia’s small CA plot yielded 200kgs of millet despite the drought, which is more than double the yield of neighbors who used conventional methods on the same sized land. On her 1.7 ha conventional farming plot, Cecelia yielded 650kgs, which is only 3.5 times the yield on an area of land almost six-times larger. Six months since her harvest, Cecelia still has 100kg of millet available for her family’s consumption. After witnessing the increased yields from Cecelia and her fellow group members’ CA plots, many new farmers from Zenzeleni village eagerly participated in CA training in July and August, and formed several new CA farmer groups for the upcoming growing season. Cecilia’s CA farming group plans to expand their area of cultivation in the future using draught power and mechanized CA to prepare planting basins. Cecelia is using CA techniques on her entire 2 hectare plot this year, explaining, “Since adopting CA, my yield was better even during a poor and erratic rainy season. CA is the best technology that I urge all community farmers to adopt. It has come as a revelation in addressing the challenge of food security both at household and community level especially for us households without any means of earning an income to feed the family.” As of early October, Cecelia had already prepared 75 percent of her plot using CA techniques. Known as Abathwa in Ndebele and Basangwa in Kalanga, the San inhabit remote areas of southern Africa, including Tsholotsho district of Matabeleland North province in south-western Zimbabwe. By tradition, the San are a nomadic people of hunter and gatherers who value seclusion from the rest of the world as a way to avoid disturbance and preserve their culture. Historically, this mobile and insulated lifestyle has made the San hard to reach for development assistance programs and has contributed to higher levels of illness and food insecurity. The Amalima program partners with San communities to improve health and income while respecting their desire to maintain traditional values. In Tsholotsho, San communities are largely found in Ward 10 where the Amalima program is building on existing communal initiatives and solidarity to address food and nutrition insecurity and strengthen resilience to shocks. Through an introductory communal meeting with an Amalima Field Officer, members and leaders of Mtshina village San community became interested in the program’s trainings, particularly conservation agriculture and the Amalima Community Health Club (CHC) concept. Both adults and children were frequently ill with diarrhoea and water-borne diseases, and the village at large was motivated to improve their community’s livelihood and food security. Traditional leaders noted that San communities in the area have felt left out of many development initiatives because they are perceived as ‘outcasts’ in local society and have historically been marginalized by the sedentary, agricultural communities. As a result of the meeting, twenty-five community members (13 males & 12 females) representing households from half the village decided to establish the Siyazama Community Health Club (CHC). As part of Amalima’s efforts to improve nutrition and health among pregnant and lactating women and children, CHC’s aim to increase awareness of water, sanitation and hygiene (WASH) practices in communities through completion of a 20 module Participatory Health and Hygiene Education (PHHE) training. CHCs foster learning for change through promotion of practical improvements at the household level (e.g. washing hands at critical times, and establishing latrines, “tippy tap” hand washing stations and rubbish pits) to change the behaviors of community members in favor of a more hygienic environment. The CHC members began receiving lessons in September 2014 from Grace Moyo, their neighbor and Community Based Facilitator (CBF), who was trained herself by an Amalima Field Officer and Ministry of Health Environmental Health Technician (EHT). After each week’s lesson, members conduct practicals at home with family members where they put their training to use. CHC member, Anna Madhumane, acknowledged how health unconscious her community was prior to the formation of the CHC. Of the widespread disregard for cleanliness she said, “People were not hygienic and, they used open defecation.” But Anna quickly pointed out that behaviors changed after the trainings: club members adopted the recommended practices. They built tippy taps, pot racks, rubbish pits, began to keep clean yards and wash their hands. “The CHC also gives us a platform to share ideas,” she said. “We talk about moulding bricks and getting more men involved to help dig pits for latrines.” The general community at large began to adopt some of the hygiene standards too – like digging a hole for ‘cat’ sanitation method for defecation and tippy taps for handwashing – which resulted in a noticeable reduction in cases of illness. At the ceremony, Anna was awarded the first place “model home” award for adopting and maintaining hygienic practices at her homestead where she lives with her 16-year-old son, two grandchildren and a 3-month-old great-grandchild. She constructed a tippy tap, rubbish pit, pot drying rack, and practices clean dish-washing. Anna indicated that she is happy with the way the community has changed and she is determined to be a champion of hygiene standards—especially after receiving her award. “The certificate is a source of motivation for me. If am lazy to clean the yard, I am motivated to keep the cleanliness of my home when I see the certificate,” she said. However, the club members recognized that their efforts to improve their community shouldn’t be limited to hygiene alone. In fall of 2014 while the CHC was at its early stages, the 25 members also participated in an Amalima conservation agriculture (CA) training to learn methods to increase yields in the arid area where they live. Most people in Mtshina rely on casual labor in the surrounding villages as a source of income, which generally goes towards buying corn meal and paying school fees. With CA, members hoped to become more independent and capable of feeding their children year-round. The training covered land preparation methods, fertilizer application, planting, pest management and post-harvest handling. After working together as a CHC group, the transition to CA was a natural process, noted Ana. In the spirit of Amalima members worked together to prepare the land and dig basins for each other’s fields—a practice which sped up the time it would take one household to do the work alone and resulted in each plot being ready for planting before the first rains. The CHC members recognized that their CA plots had much higher yields than farmers who practiced conventional farming and had a very poor or failed harvest. With this in mind, the members have already started preparing land for the upcoming cropping season. Each household plans to use CA methods, focus on planting millet and sorghum (small drought-tolerant grains) and avoid the more water-dependant maize. With the support of Amalima, Mtshina village is also establishing a nutrition garden where kale, tomatoes, carrots, sweet potatoes and other vegetables will be grown for consumption and sale, generating income and improving dietary diversity for 50 households. “A few years ago,” Ana started, “if Amalima had approached our community, we would have fled, or hid, wishing to avoid contact with outsiders.” But now, Mtshina village is showing a commitment to hygiene and food security, which will benefit themselves, their children and grandchildren. Hazelnuts are an important crop for many of Georgia’s farmers, but growers face a number of production and harvesting challenges that have, until now, limited their success. Iveri Kvaratskhelia, a hazelnut farmer from the Nakipu village Nakipu in the Tsalenjikha district of Georgia’s Samegrelo region, was intrigued by the trainings provided by the USAID Economic Prosperity Initiative (EPI). At that time he owned four hectares of hazelnut orchard. Through EPI, Mr. Kvaratskhelia learned modern methods of farming, including new orchard establishment techniques. Following the trainings, he added five new hectares to his hazelnut production. EPI’s trainings have helped improve farmers’ productivity and quality. To date, more than 1,000 farmers and service providers have benefited from the improved hazelnut production methods and post-harvest handling practices learned at these trainings. Mr. Kvaratskhelia then established an informal farm group with 25 other hazelnut farmers. With EPI’s support, he was able to transition the informal group into an established agricultural cooperative. EPI linked the cooperative members with the Georgian Hazelnut Growers Association, which serves its members with free de-husking and drying services for their produce. As a member of the Association, Mr. Kvaratskhelia was able to dry his 2013 crop, and stored seven tons of hazelnuts using modern methods of post-harvest handling. As a result, his inventory had higher than average kernel outcome rate (the rate of sellable nuts per container), reaching 44%, whereas the average in Georgia is only 36%. Mr. Kvaratskhelia stored his produce until January 2014, when he sold his hazelnuts at price premium of 0.25 GEL per kg, due to their high quality. Farmers like Mr. Kvaratskhelia will continue to implement the best practices they learned through EPI’s trainings, and will reap the benefits of belonging to an association. Thanks to EPI, they will experience improved productivity, increased quality, and be able to access premium prices for their products. Improving dietary diversity and quality of foods consumed by the entire Zimbabwean household was the driving force behind the collaborative baseline study conducted recently by Amalima, a USAID-supported program managed by CNFA. The Amalima program promotes the adoption of new practices in agriculture, disaster preparedness and infant and young child feeding to improve nutrition in over 66,000 households in Tsholotsho of Matebeleland North and Gwanda, Bulilima and Mangwe of Matebeleland South. An analysis of nutrition in the region led to the conclusion that nutrition problems are a result of household feeding practices and behaviors, rather than a direct result of food shortages. As such, rather than offering prescribed solutions and recommended practices, the formative research will seek to better inform what motivates the individual behaviors, interests, attributes and particular needs of the communities the program will be serving over the next five years. Preliminary tests and research allowed the Amalima team to capture baseline information on everything from what crop varieties are grown in the region, what assets are desired by the community and the level of household nutrition. These results, along with lessons learned, will be used to inform a broader survey that will drive program activates moving forward.